When you make your own txtsetup.oem file, you can just combine several txtsetup.oem files by simply joining them in Notepad. So in the txtsetup.oem file below, the keys which are the same colour need to match each other. You may find that in some txtsetup.oem files, both the ID and the DriverKey are the same, but they don't need to be! iastor7="Intel ICH9/ICH10 SATA AHCI/RAID RST 11.2"
If you want to specify a default driver, just have one entry (as shown) in the [Defaults] section and only have one [Defaults] section in the whole file. \disk1 is a file that must be on the source F6 floppy disk. XP will identify which floppy the driver is on by looking for this file. The PCI IDs used in txtsetup.oem is NOT checked by Setup - whatever driver you tell it to load is loaded by Setup - if the driver reports that if failed to load or recognise your hardware, Setup will report a problem. If you want to add more txtsetup.oem files, just add them on to the existing txtsetup.oem file, one after the other (but just have one [Defaults] section). Note that the driver.sys name MUST match the 'service' name used in the HardwareID driver line. You can only have one driver= line (any others will be ignored). Note that the (single) driver.sys file specified in the driver= line will be the one copied over to the hard disk. Therefore, this needs to be the one that is mentioned in the INF file, otherwise XP GUI Mode setup will complain about a driver missing from C:\Windows\OEMDir at about the 34 minute mark! However, if you want to copy across more driver files than just the one allowed per section (or any type and number of extra files), just add more 'catalog=d1,fred.sys' lines, as many as you like! The files specified will then be copied across to the hard disk C:\Windows\OEMDir folder. You can get XP to automatically load by default both an AHCI driver AND FiraDisk by having almost IDENTICAL floppy disks each containing ALL of the files needed by both the AHCI driver and the FiraDisk driver. Both disks should have the same identifying disk tag file (e.g. disk1 in this case). The ONLY difference is that in one txtsetup.oem you set the [Defaults] section to your AHCI driver, and on the other txtsetup.oem file you set the [Default] to Firadisk. (in fact, the txtsetup.oems don't have to have the non-default sections - e.g. on the FiraDisk default txtsetup.oem you can remove all the AHCI driver sections if you want to). XP text-mode setup will get confused if you don't use the same disk name tag file for both disks and have the same files on both disks, so you need to have all the driver files on both disks so that 'Drive A:' (which is whatever it accessed last just before the 'copyfiles' stage) will always contain the correct files when it tries to copy them from the F6 floppy just after formatting the internal hard disk. (It is just possible to have different disk tag files but you will still need both sets of drivers on each disk and you have to swap over the disk tags (i.e. disk0 oemsetup has 'disk1' as a tag and disk1 oemsetup has 'disk0' as a tag). It is MUCH easier just to use the same tag file and same contents on both disks! For more details about txtsetup.oem syntax, see here - but it does not mention the fact that the driver.sys name must be the same as the SERVICE name. I hope this saves someone hours of work! 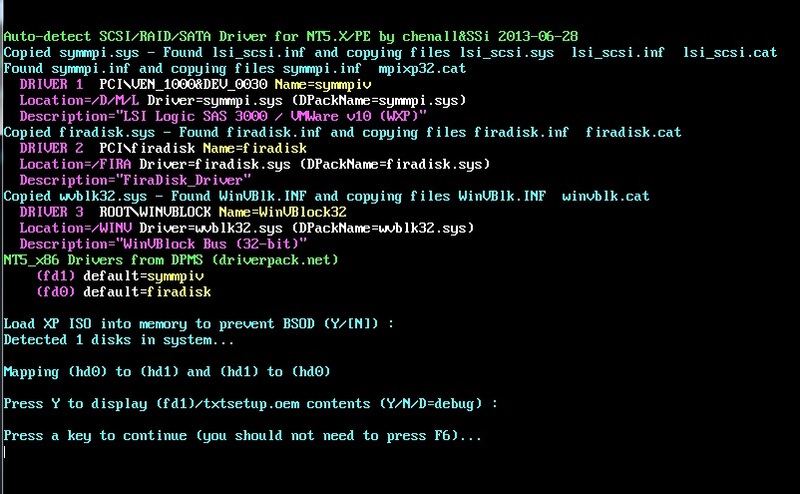 Easy2Boot Upgrade DPMS package (BETA) now available for BETA testers only! 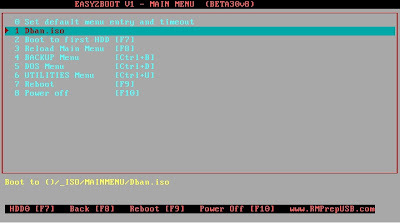 News - July 2013: New DPMS2 is now integrated in Easy2Boot and it is automatic - no need to press F6! This enhances the current XP install from ISO menu. If you add the updated E2B files and download and add the DriverPack Mass Storage driver package (approx. 8MB download but 50MB when unzipped) you will have the option to autodetect the correct AHCI/SATA/RAID driver. Or try Chenalls latest DPMS and just extract the D folder and DriverPack.ini (not dpms.bat!). The installation method is still the same - you must manually use F6 and select the AHCI driver + Firadisk driver ( + WinVBlock driver (optional)) - however usually there will only be one AHCI driver present in the F6 list, so you will not have to guess which one to pick! Also, as the DriverPack contains non-Intel drivers, E2B XP installs from ISO should now work on non-Intel AHCI platforms. News: After hours of hair pulling and midnight oil, I have a DPMS version now which loads firadisk AND the AHCI driver automatically (no F6 press required)! 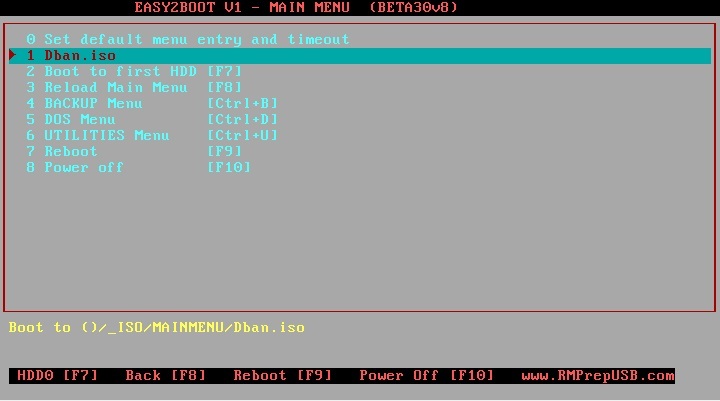 It is integrated in the Easy2Boot v1 download. I have decided to release E2B now as v1.00. It is virtually identical to the last BETA (just a few changes to the colour syntax in E2B.cfg as grub4dos now supports names for the color command - e.g. color normal=blue/light-blue, but I have left the old colour variable definitions in so older MyE2B.cfg files will still work. Now it is officially released, I suppose I can expect a flood of bug reports (as this always seems to be what happens when people are afraid to try beta s/w)! There was bug with the bad bios detection script due to the way grub4dos reports drive geometry. If you found that BETA30 v10 gave a red error message on start-up about a bad bios, upgrade to BETA30 v11 which should fix that. I have added David B's great new utility Start_VM.exe to this version. Start_VM.exe automagically dismounts the USB drive before running QEMU - this allows QEMU to have full write access to the USB drive. This means that any writes which are made to the USB drive under grub4dos or an OS booted to via grub4dos will actually work and the sectors on the USB drive will be permanently changed. For instance the default command will work in this mode as data will be written to the \default file or linux with persistence will work. This mode will now be the 'standard' mode for all future RMPrepUSB versions as it gives full rd/wr emulation capabilities and more reliable OS booting! Ctrl+Shift+F11 - boot from USB drive in 'snapshot' mode. This used to be the default action in previous versions of RMPrepUSB (used to be F11). This mode is still useful if you want to be able to modify files on the USB drive whilst QEMU is running because the USB drive is not dismounted. This allows you to make simple changes (e.g. colour or menu position) and reload the menu whilst still running in the QEMU session and so this mode is still useful in some cases. See here for details of the change. I have changed the menu headings and menu footer code slightly. Now you do not need to change the padding if you change the menu box position as it is automatically calculated. You no longer have to do this as the spaces will be added automatically as now it is padded out by the code which looks at the rstart value for the border setting that you use in your MyE2B.cfg file. This padding (%HPAD%) is applied to all headings and footers. In this version, Step 1 of XP install defaults after 3 second timeout to not load the ISO into RAM. If Y is pressed and then Enter, then the ISO will be loaded into system memory. To speed up the process and not wait for the timeout, instead of waiting 3 seconds, just press the <Enter> key.